As an avid reader (I go through about one book a week), I like to keep up with my field of expertise (marketing & communications) as well as educate myself on parenting, since I still have plenty to learn on the subject! Since I became a mother almost four years ago, I’ve read dozens of books on child raising, from breastfeeding, to baby development, to nutrition, to medical issues, to parenting, and more and more now, on discipline. By the way, the most complete and easy-to-read reference book for babies from birth to five is Caring for your baby and young child from the American Academy of Pediatrics. With a two-year old who feels compelled to automatically answer “no” to all questions (except when there’s food involved) and argue about everything, and a four year-old who is still far, far away from the age of reason, I often find myself in intricate situations where I wished I could wave a magic wand and erase all negativity from the air. I’m still looking for that magic wand, but there’s a pretty good book I can recommend to parents with children of all ages (from about 2 to 18). The content is very dense, and by that, I mean there’s a lot of information to process but it’s a very easy read. After finishing the book, I’m sure I missed a few points or already forgot about some useful strategies. I now need to go back with a highlighter to mark the parts that I’ll put to good use. By taking a close look at your issues and becoming conscious of how you currently handle a situation and what you could do instead, you’ll start applying the strategies to your own family more easily. Don’t decide to tackle every single issue going on at your house. Take the most pressing, most disturbing conflict you have, and arm yourself with a strong partner in this book. If only one parent decides to implement the strategies discussed in this book, it makes it very difficult to be consistent and effective. Even if you share some of the tactics, your partner may not apply them correctly, and if you try to correct him/her, you may face some resistance and criticism, instead of support. So enroll him/her by roleplaying. You actually may have some fun at it! How many times can you repeat, “it’s mine!” with a straight face? At first sight, they look corny, but gosh, they’re very useful in remembering the numerous tips! 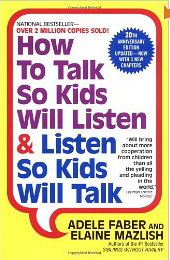 There are many, many good strategies and tactics discussed in this book, including how to break the cycle from your own parents’ discipline style (if you think their style was inappropriate), how to make your child open up and trust you to discuss many issues, and how to use praise appropriately to empower your children. I’ll cover the topic of praise in another post when I discuss the book Nurture Shock (another great read! ), but Faber and Mazlish explain very well that it’s more important to “describe the child’s good behavior” than to “praise it”. Take the example of a child who consistently forgets to eat with his fork and show a preference for his fingers. You’ve told him time and time again to use silverware but he doesn’t hear you anymore. The next time you encourage him to use his fork and he does it, instead of saying, “I’m so proud of you for using your fork”, actually state, “I see a boy who uses his fork to eat like a little man”. It sounds silly, but leaving it at the observation level makes your kid draw all of the conclusions himself (i.e. mom noticed I used my fork, she must be proud of me), rather than focusing on your own feelings. The point is to help your child make HIMSELF feel good and wanting to continue the good behavior. I speak from experience when I say that stuff really works, even on little kids (2 or 3 years old). I use this positive reinforcement description tool all of the time. 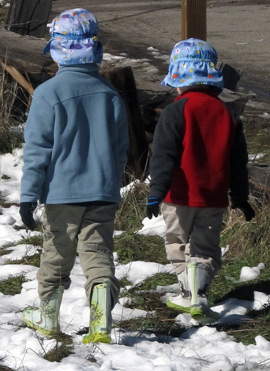 For example, I’ll say “I see two big boys walking nicely on the sidewalk” when they behave as expected, rather than not notice the good behavior and have to correct the infraction if they start running away or acting out. I can see that my noticing their good behavior makes them feel very proud (they grin and start to giggle). It’s a wonderful feeling for me too, and it saves me some stress! So I hope you have a chance to borrow this book from your local library or a friend, or buy it from your favorite bookstore. When you’re done reading, stop by and let me know what you think. I’d love to have you share some success stories with other parents.